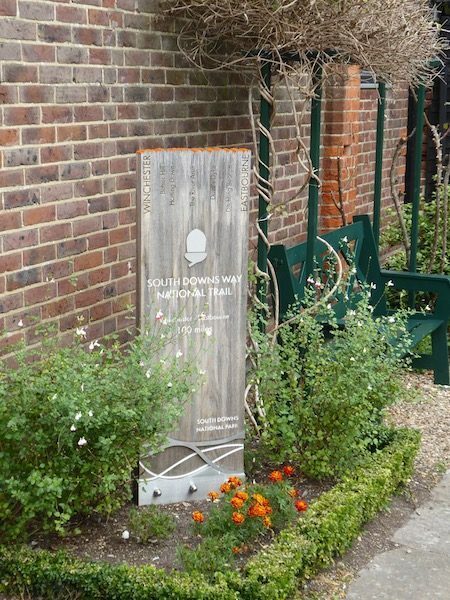 After weeks of preparations the day has finally arrived when I set off to walk the South Downs National Trail. This is the first time I have tackled a long distance walk over multiple days. I have often walked long distances on consecutive days, but on those occasions I have carried a day sack, now I am heading off with all my gear for the week. I am very confident of walking the distance; my only trepidation is whether my back will be up to carrying the weight. For over forty years I have had back problems and only regular trips to the physiotherapist enable me to walk as much as I do. It is no exaggeration to say that Barbara, the physio I have been visiting for the last fifteen years, has transformed the quality of my life. She also did a great job when Lynnie broke her leg a few years ago. So bags packed, boots on and I am ready. After pats on the head and kisses for Lynnie and the dogs, you can muse over who got what, I am off. But my early start only covers a few hundred yards as I am getting a lift to my starting point, Winchester, from my friend Stuart. 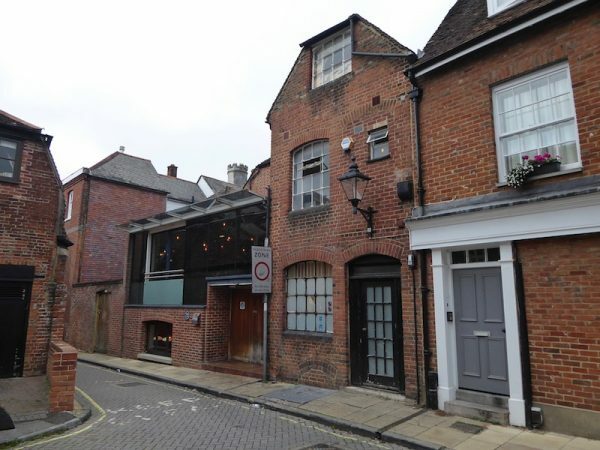 In Winchester I wander along to Little Minster Street, this has nothing to do with my walk but it is a place I have wanted to check out for a while. My maternal great grandparents lived in this street and in 1898 it was the birthplace of my grandfather. Most of the houses in the street are original, but sadly the one I am looking for has been replaced by a more modern building. 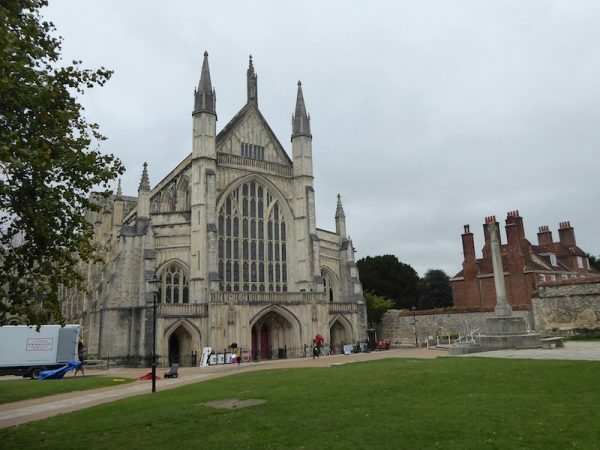 I wander into the Cathedral Close. 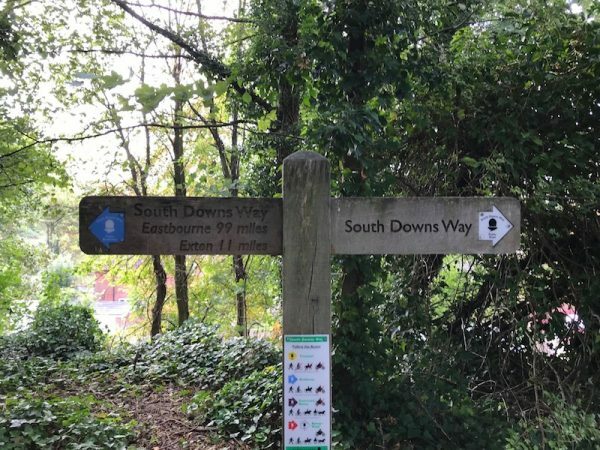 Apparently until a few years ago the actual starting point of the South Downs Way National Trail (SDW from now on) was not actually clear. 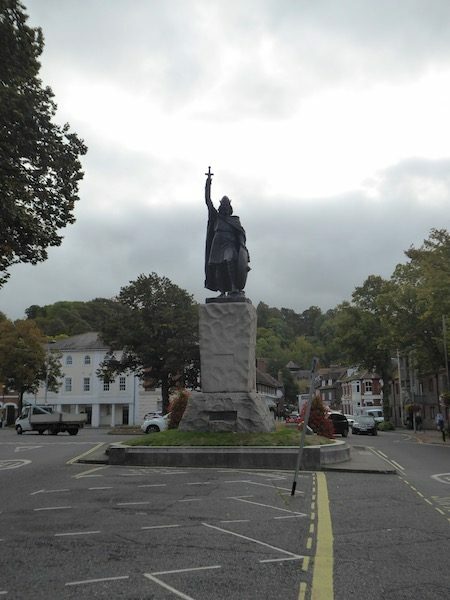 I have read that some would start from the cathedral and others from King Arthur’s statue. Now there is an official start point at the City Mill. Leaving the Close I wander down the High Street, whilst workers rush to start their days toil, to reach King Arthur’s statue. 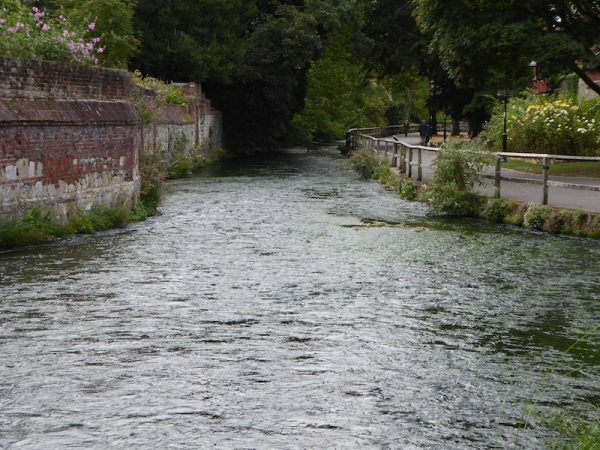 Now it is only a short walk to the City Mill besides the River Itchen. 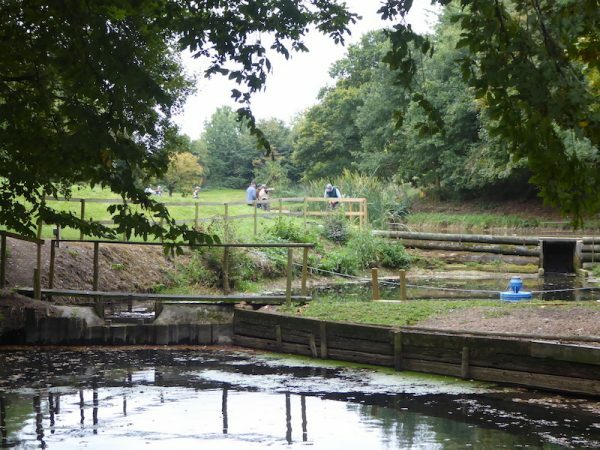 The National Trust own the City Mill and their website claims it is probably the oldest working watermill in the country. 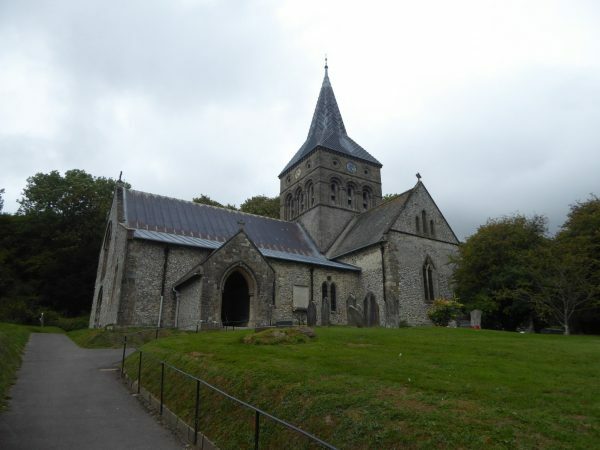 Records from 932 AD refer to the mill and it is recorded in the 1086 Doomsday Survey. I make a note to visit here some time with Lynnie. It is not open this early in the morning, which is probably a good thing because I have 19 miles to cover today. 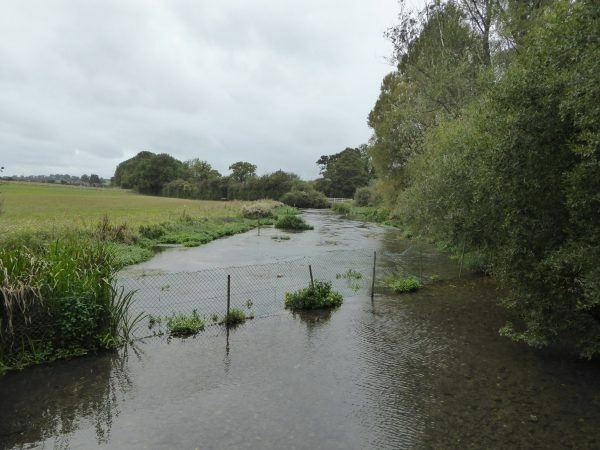 I turn around and start on the SDW Trail walking besides the River Itchen. I am not going to describe every twist and turn, it is well way marked and frankly there are so many guidebooks and maps devoted to the topic. 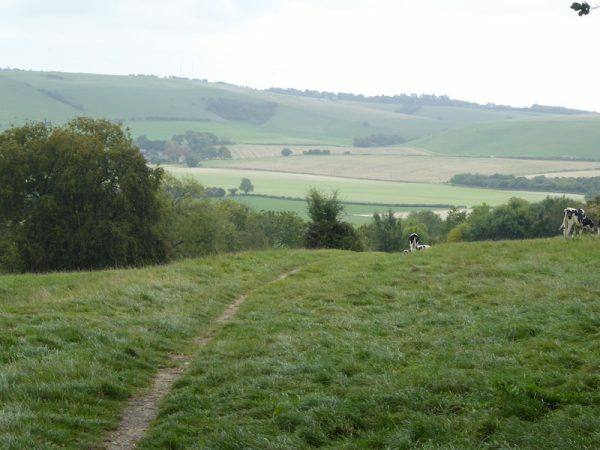 I am carrying the Trailblazer South Downs Way Guide Book and a Harvey’s South Downs Way map, the latter handily showing the complete trail on one map. As back up I have the OS map app on my phone. Walking besides the river I realise I have a different gait, I am not sure if this is because I am now a long distance trail walker or if my rucksack is wrongly adjusted. I stop and adjust my rucksack! Following the way-markers I leave Winchester via East Hill and the Petersfield Road. I am now on the edge of Twyford Down, accompanied by the constant drone of traffic on the M3, I cross on the bridge. Back in 1991 this was the site of mass protest against the construction of the M3 motorway which cut an ugly swathe through the chalk down. 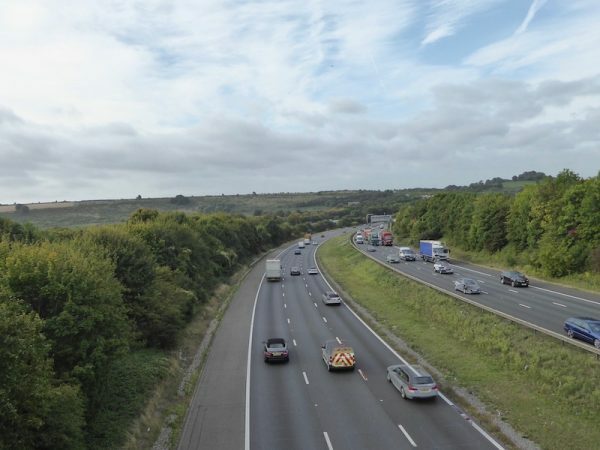 The then transport minister Kenneth Clarke had decided this was the correct route to alleviate the problems on the old Winchester by-pass and dismissed a proposal to build a tunnel. 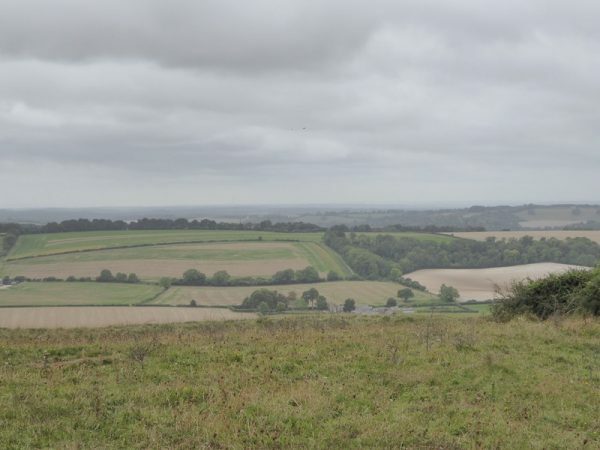 Despite lengthy protests the road was completed and has created a lasting blotch on what was a beautiful area of chalk downland. On the other side of the motorway I am soon into open country heading towards Chilcomb. Heading uphill out of Chilcomb I catch up with a couple who have also started the SDW this morning, their first stopover will be after 11 miles in Exton. We chat briefly before I head on; I have a bit further to travel today than them. 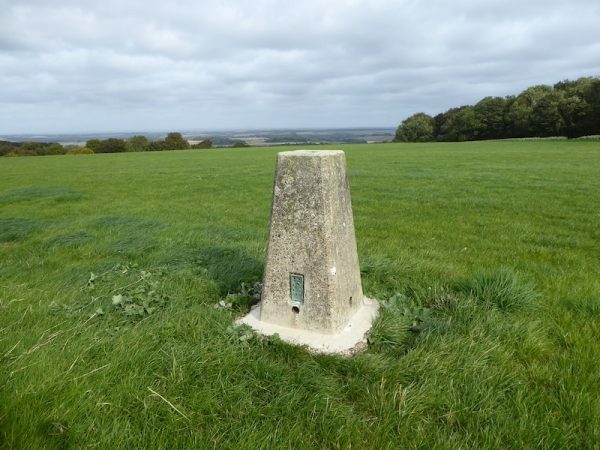 After crossing the A272 I take a slight detour from the path to head up to the trig point at Cheesefoot Head this is the ninety-sixth I have bagged. Back on the SDW I follow the track through woodland and then along a track turning right at Keeper’s Cottage. Continuing along the stony track I once again catch up with the couple I met on the hill at Chilcomb. We chat for a while as we walk along. They have allowed themselves two weeks to do the trail and are having their bags carried between bed and breakfast stops. This approach works well for those not wanting to carry their kit, if Lynnie was with me we would have adopted this method, either that or I would be carrying for two! 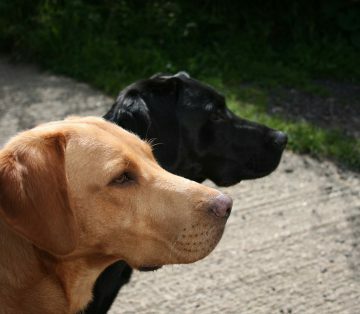 After a mile of walking together I bid them farewell and continue along at my normal walking pace. I am heading along at a steady pace and having covered eight miles have started to acquire the air of confidence that I am now a fully-fledged trail walker. 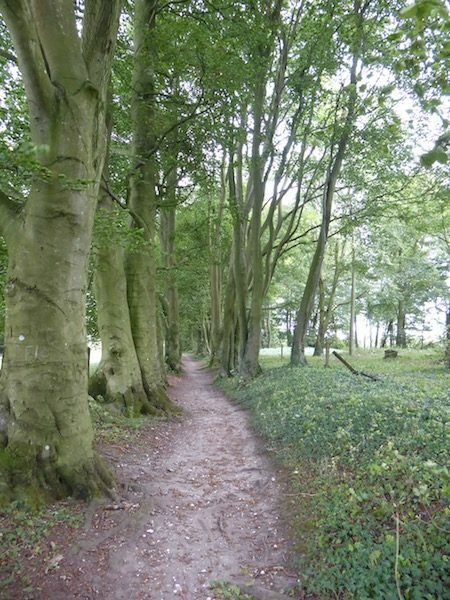 After admiring the view and then reaching a gateway, I carry on into some woodland and having gone twenty yards think to check the map. Sure enough I should have turned right just before the gate to follow the SDW markers, which I missed because I was not concentrating! A salutary lesson learnt, in future I will not guess the route when I come to a junction. 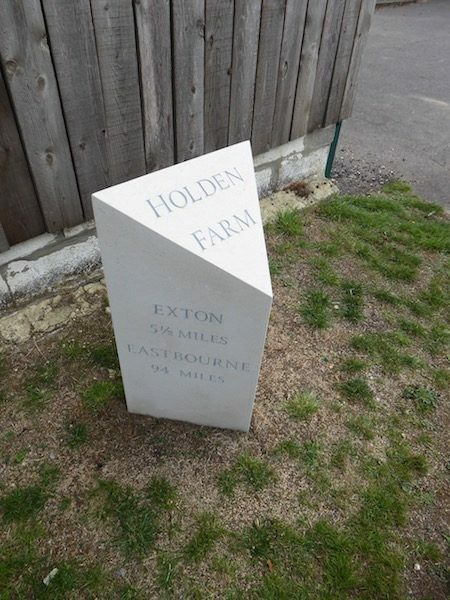 Now assiduously following the SDW markers I head down the hill to cross the A272 and then pass Holden Farm, I use the water tap here to top up my bottles. 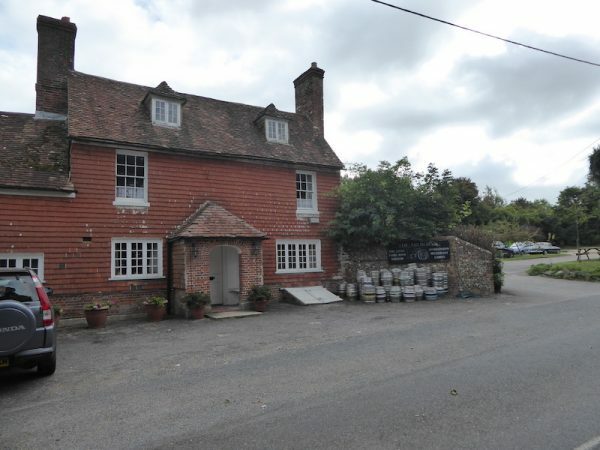 The route joins a tarmac lane leading to a minor road where I turn right passing The Milbury’s public house. It is busy and I am tempted to stop for a sharpner, but I am not a keen daytime drinker and decide to stick to water until my day’s walking is complete. At the crossroads just past the pub the SDW goes left and follows the road for a while before going through a tree lined path besides the road. At a finger post I cross heading around Wind Farm and then onto Lomer Farm. 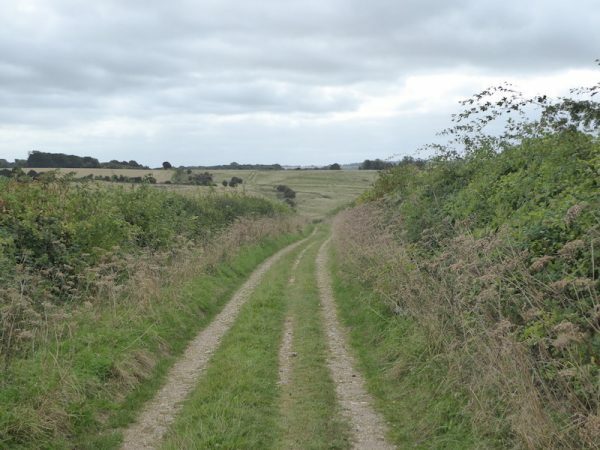 After passing through the farm the route carries on to join a minor road, Beacon Hill Lane. 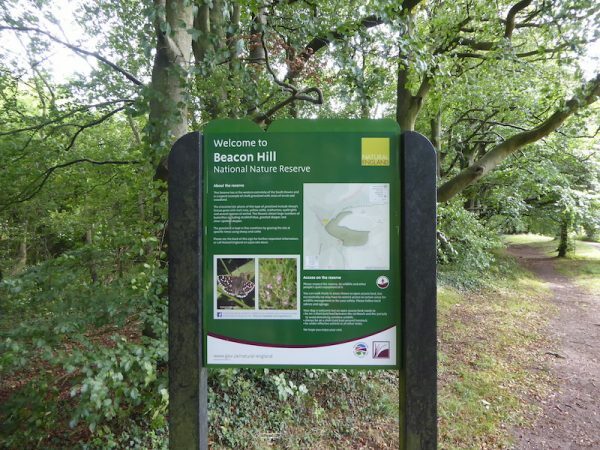 After a short section on the country road the SDW enters Beacon Hill Nature Reserve. It is tempting to sit on a tree stump and have lunch, but instead I decide to wait until I reach Exton in another mile or so. 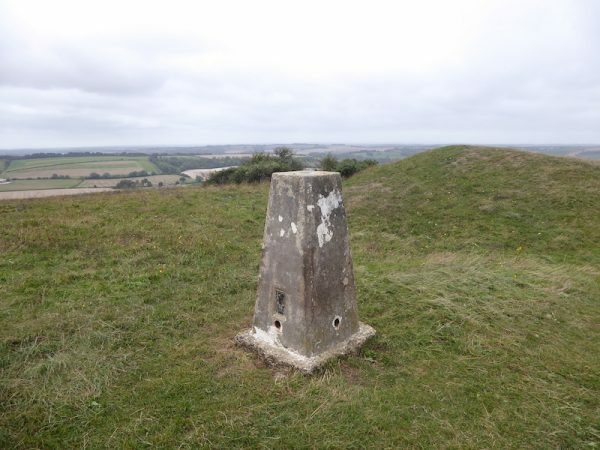 Just as the SDW turns right to head downhill I reach the Beacon Hill trig point, number ninety-seven bagged for me. The SDW soon reaches a road and turns left, and then there is an option of routes. 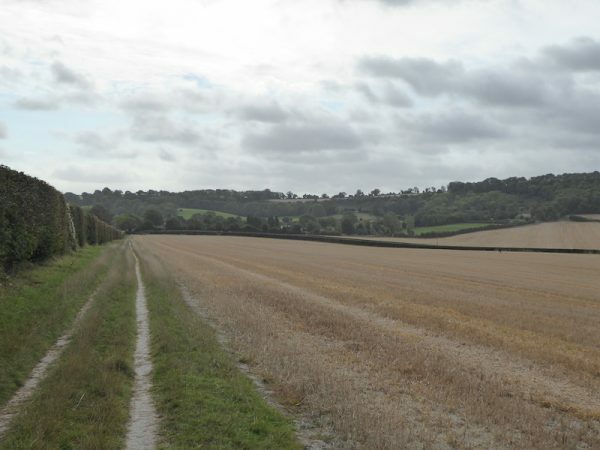 I decide to leave the road, the cyclist and horse rider route, instead choosing the walkers’ route that heads steeply downwards over chalk downland to fields that I cross to enter Exton. Turning left along Church Lane I spot a bench in the churchyard; this is the first bench I have seen since leaving Winchester and is an ideal spot for lunch. Refreshed I continue through the village staying left when the road forks to pass Manor Farm. Reaching the busy A32 I cross to join the SDW on the opposite side and then cross the River Meon. A couple are standing on the bridge taking pictures and we chat about the pleasures of being out in the countryside. Soon the route crosses a disused railway line before turning to head uphill. 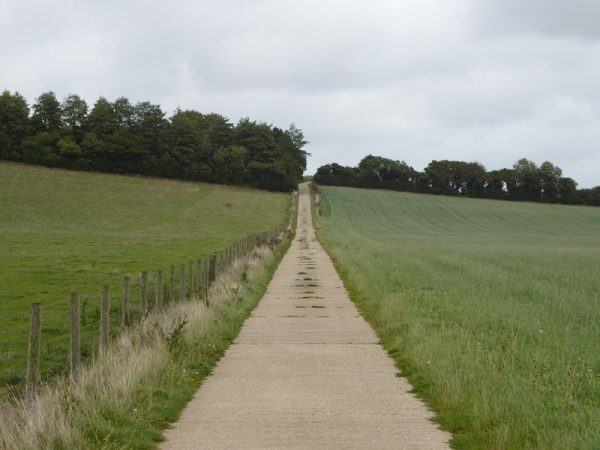 This is a steady bit of up and it gets even steeper as I approach the Iron Age Hill fort on Old Winchester Hill where sheep graze on the downland meadows. 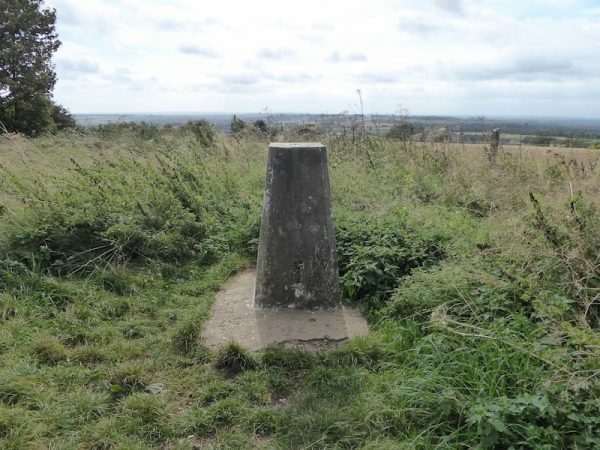 At the top of the hill there is a trig point, the 98th I have bagged. Walking through the nature reserve the path soon goes besides a track and then approaching a road turns to the left to head north with stunning views out to the west. After a parking area I join a road before turning sharp right into a field to head downhill. 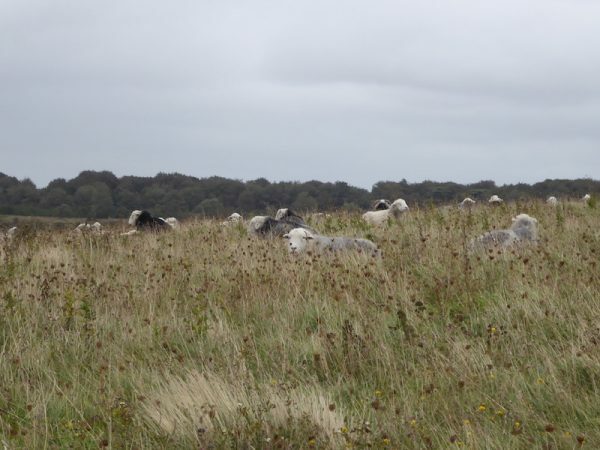 The field contains young cattle, but they seem relaxed and I have just watched a runner pass through them. When walking with the dogs I am usually wary of cattle, but these are walking away from me so I continue without any concerns. Then I hear hooves behind me and see that one has broken away from the rest and is heading towards me at pace. I resist the temptation to run, instead turning to face it, this has the desired effect, but as soon as I turn my back it advances again. We play this game a few times before it decides I am not really of interest and turns away. Nevertheless it is with some relief that I reach the gate at the bottom of the field and turn towards Whitewool farm. 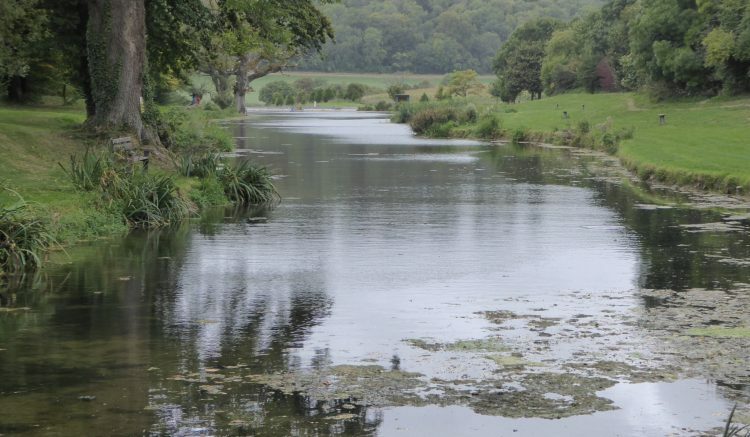 [The route soon takes me past Meon Springs where the fly fishermen are out in numbers. 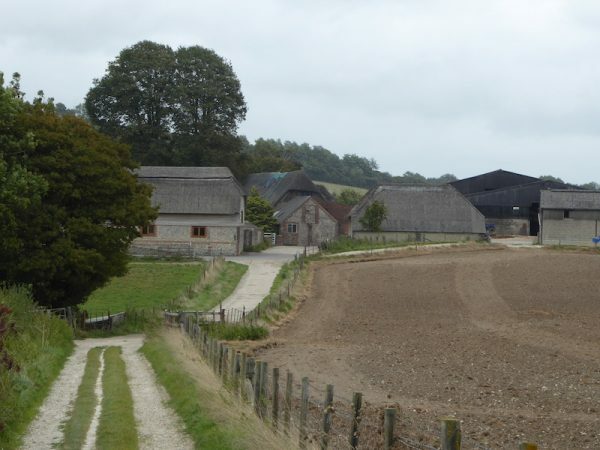 After a brief section on the tarmac lane the SDW turns left heading uphill on a concrete farm track. When the SDW reaches Halnaker Lane it turns right, however, I continue straight on along a downhill footpath to Coombe Lane where I turn left into East Meon. 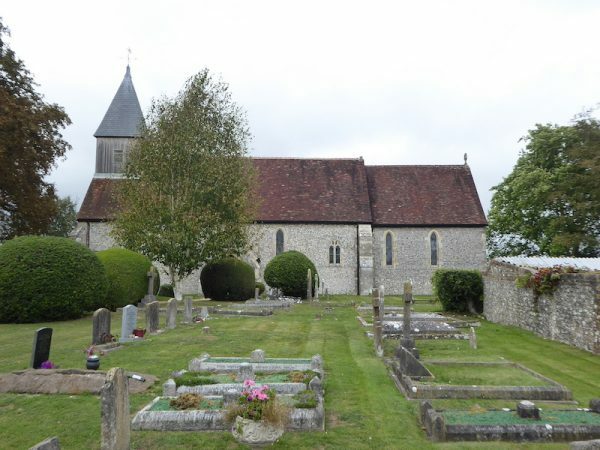 Before heading to my bed and breakfast I wander through the village to the striking All Saints Church. Unusually the church contains two fonts, one of which is a Tournai Font, the likes of which I have not previously seen. 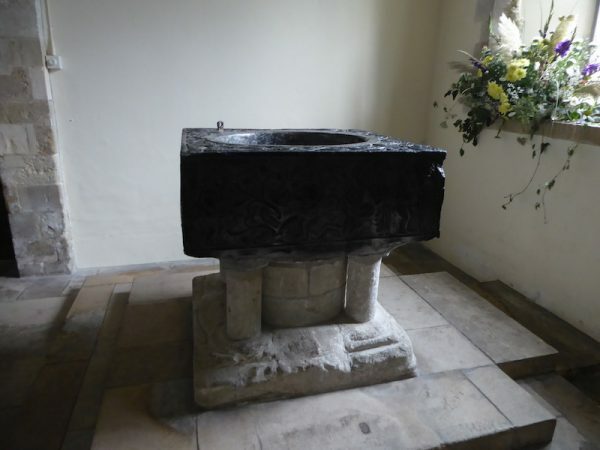 It is ornately carved black limestone and comes from the Belgium town of Tournai; apparently there are only seven like it in England, four of which are in Hampshire. I wander back to Ye Olde George Inn and take the lane to the right of the pub to Pound Orchard B&B where I am warmly greeted by Ron and Wendy. I soon realise I have chosen well, this is a lovely modern B&B located right next to the pub. Showered and refreshed I adjourn to the Ye Olde George Inn to meet up with my friend, and website wizard, Andy to spend a couple of hours in his excellent company. It is a pity that the food and ale were not of the same standard. Over the years I have made a point of avoiding any pub or café calling itself “Ye Olde”, tonight’s visit has reinforced my view. It has been a cracking first day. 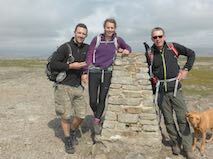 I’ve covered 19 miles with 2,276 feet of ascent, managed to bag three trig points and had a couple of interesting chats with fellow walkers. On the downside I had a worrying encounter with a cow and had to drink Badger beer in the evening. One thing for sure I am ready for my bed! 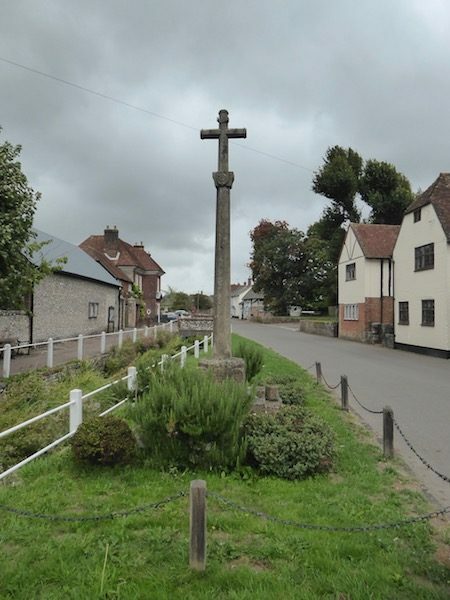 To follow our walk you will need Ordnance Survey Outdoor Explorer Map OL32 –Winchester. It was a shame the beer didn’t match the company!